Kady, Ezra, Hanna, and Nik narrowly escaped with their lives from the attacks on Heimdall station and now find themselves crammed with 2,000 refugees on the container ship Mao. With the jump station destroyed and their resources scarce, the only option is to return to Kerenza - but who knows what they'll find seven months after the invasion? Meanwhile Kady's cousin, Asha, survived the initial BeiTech assault and has joined Kerenza's ragtag underground resistance. 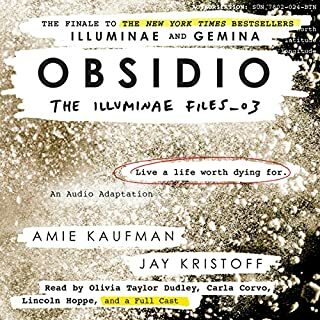 I don't think you'll find another audiobook like this one! The amount of work that clearly went into it to make it as real and immersive as possible is just amazing. I read the first two books, and honestly thought that it couldn't be done as an audiobook. But then I didn't have the time to finish the last one so I thought I'll try the audiobook while I work. It was so incredibly amazing! I couldn't stop listening to it!